I decided not to be stubborn and started afresh on Ambleside on 6 and 7 mm needles, like the pattern says, and which gives me the right gauge. I’ve just started the second ball now so I am now just as far as I was last week on the 5 and 6 mm needles. It looks very good, and a bit less tight, which is good, because I want to be able to wear it over a blouse or maybe a thin sweater. I still have to frog what I knitted last week, because I couldn’t get myself to do it. It looks so nice. I think in a few days I will be able to. I was also hoping the big cables would be easier to knit on 7 mm, but I am still having problems. They distort the fabric very much and the stitches I knit from the cable needle are getting very tight. I’ve watched videos on YouTube to see if I was doing anything wrong but it seems not. And the small cables are going fine. Maybe it is just something you have with such an unusual big cable ( it is knitted over 20 stitches). The day before yesterday I really wanted to knit on Lauren again. So I guess my plan is working. If I don’t feel like 4ply, I can knit my chunky tunic, and if I’m sick of those big needles I can knit on Lauren. I knitted a few hours on the left front but it still isn’t finished. But I am almost there now. I am bit stuck on the Baxter mitts. I am knitting them on smaller needles because they would be too big for me if I would knit them on the right gauge. But now they are getting too small…so irritating. 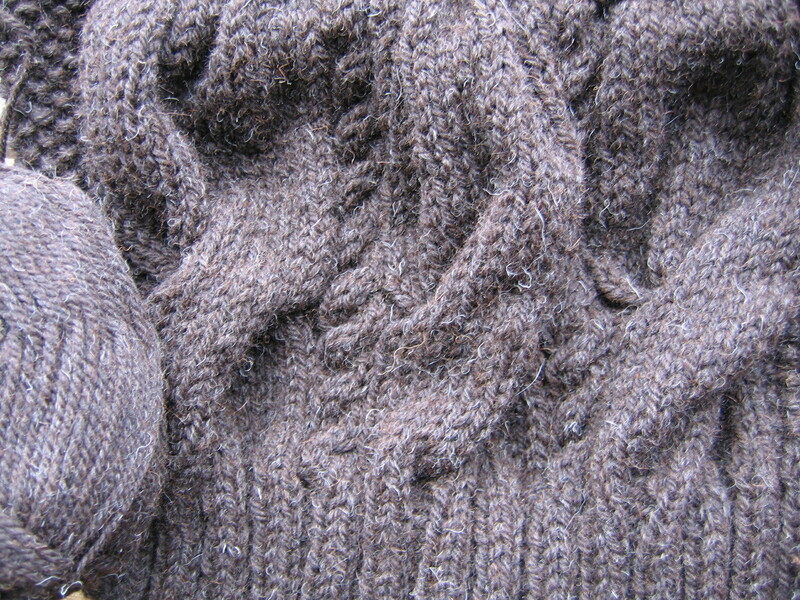 The ribbing is perfect, but the fair isle part is really small. And I’ve found out now that fair isle fabric isn’t stretchy at all. So it would be best to frog back to the ribbing and do the fair isle part again on a bigger needle. 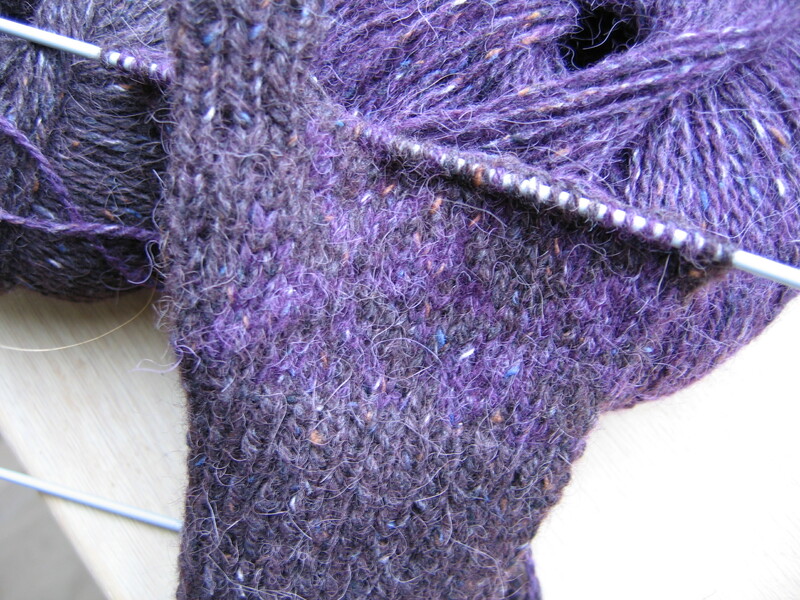 But I know how much work this small part of fair isle was…maybe next week I’ll feel up to it. I do have days when I can frog really easily and without regret, but not today. Rowan has a preview of Rowan 47 on their website. There are a lot pale colours this year, but after a while I could see through that and there are many designs I like. There are some really new shapes like this pink one (knitted in Kid Silk haze?) with unusual sleeves and a frill detail. I love the flared sleeves. What a perfect design, I can’t wait to see a bigger picture. There seems to be some texture or cabling on the shoulders, but you can’t really see it here. I think I wouldn’t knit the heart, but I love the different stripes and the raglan sleeves. I am looking forward to spring…but in fact winter has just started here, this is the first really cold day in The Netherlands. But I am definitely going to buy this magazine in january. This entry was posted in in progress, pattern books. Bookmark the permalink.